A couple of months ago I read 84 Charing Cross Road by Helene Hanff for book club. Like millions of other readers before me, I thought it was a lovely gem of a book. I loved the letters, the humour, the conversation about books and so much more! I knew, therefore, that I wanted to read the follow up book, The Duchess of Bloomsbury Street. 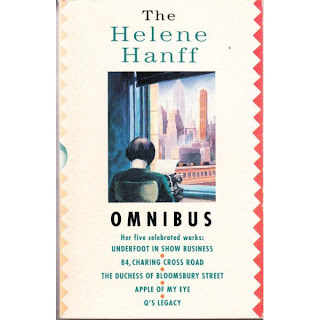 Unfortunately my library didn't have the book so I had to request the Helene Hanff Omnibus from another library via interlibrary loan. I was planning to read at least one of the other short books contained in the omnibus but I think I am going to run out of time because I actually picked up three interlibrary loans on the same day and they are all due back on the same day as well. Now that I am a fair way through The Duchess of Bloomsbury Street, I do feel that I can compare the two books. Whilst Duchess is a fun read, I don't think it is as well balanced as 84 Charing Cross Road. 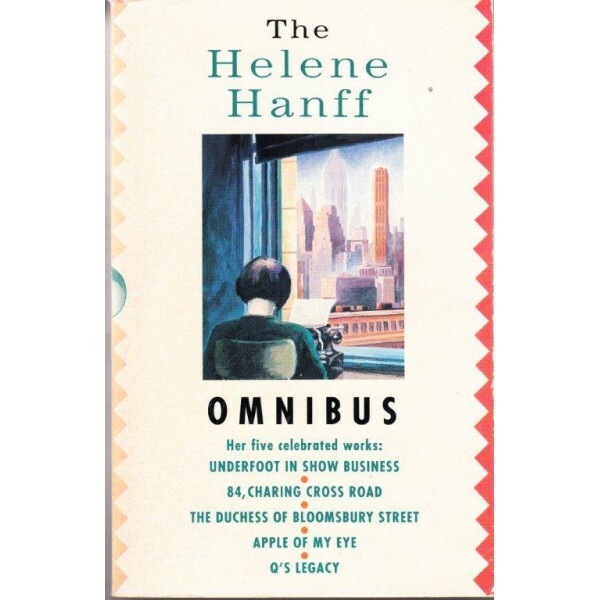 Rather than being an epistolary book comprised of the letters between Helene Hanff and the staff at the bookshop at 84 Charing Cross Road, this book is more of a diary format, telling of Helene's experiences when she finally makes it to London after so many years of wanting to visit. To be honest, I miss the letters that provide a counterbalance to the voice of Helene. She is still funny, but there are times when it comes on too strong. I am withholding final judgment until I do finish it, but I think it is fair to say that I liked Duchess but it won't get as strong a grade as the one that I gave to 84 Charing Cross Road. Having said that, I do find Hanff's pure joy of finally living her dream by visiting London and meeting some of the people that she had corresponded with for years totally infectious and is making me wish I could go to London again. One day I will get back. One thing that I did find interesting that I thought I would share today is the story of Helene's reading journey. Q (Quiller-Couch) was all by himself my college education. I went down to the public library one day when I as seventeen looking for books on the art of writing, and found five books of lectures which Q had delivered to his students of writing at Cambridge. Milton assumed I'd read the Christian version of Isaiah and the New Testament and had learned all about Lucifer and the air in Heaven, and since I'd been reared in Judaism I hadn't. So I said, 'Wait here,' and borrowed a Christian Bible and read about Lucifer and so forth, and then went back to Milton and read Paradise Lost, and then finally got back to Q on page 3. On page 4 or 5, I discovered that the point of the sentence at the top of the page was in Latin and the long quotation at the bottom of the page was in Greek. So I advertised in the Saturday Review for somebody to teach me Latin and Greek, and went back to Q meanwhile, and discovered he assumed I not only knew all the plays of Shakespeare, and Boswell's Johnson, but also the Second Book of Esdras, which is not in the Old Testament and not in the New Testament, it's in the Apocrypha, which is a set of books nobody had ever thought to tell me existed. So what with one thing and another and an average of three 'Wait here's' a week, it took me eleven years to get through Q's five books of lectures. I am not saying that I would like to take 11 years to read a single book, but I can trace my reading tastes and habits to a degree. For example, I read Diana Gabaldon because her book was given to me as a gift. From there I discovered Sharon Kay Penman and Paullina Simons. From Sharon I started reading Elizabeth Chadwick and from Paullina Simons I read Belinda Alexandra! I could go on and on, but it gives you an idea of what I am referring to. Can you track your reading from one book or one author to the next? I liked the Charing Cross rd book very much. I'd like to read any of her follow up books. I am definitely glad to be reading it Mystica! That's hilarious! More people should be so interested in self-education. :) My teaser is here. Glad you enjoyed it, Julie. Me too, but it as interesting to look at how another person likes to read. I love 84 Charing Cross Road, and read it several years ago, so this book is of interest to me. It sounds like it was very different than the first book, but also interesting as well. I do hope that you are able to check it out again and finish the rest of the stories inside! Great review today! Zibilee, I ill definitely try and get it again to read the other three or four books in the omnibus. Self-education, yup, did that. But mine was nonfiction reading. I dropped out of college when I got married, though not by choice (my husband said, "Women don't need higher education"). When I would take my three children to the library twice a week, I would pick a book or two from the philosophy and religion shelves. On finishing one of those, I would look through the bibliography to find similar books -- we didn't have the internet in the 1960s, much less Google. Then I'd read the next book and check the bibliography for something else my library had a copy of. When I went back to finish my college degree, I was already ahead of the other students. I went on to get a Master's degree and worked on a doctorate, partly because I knew how to study on my own. Bonnie, you are so amazing and inspirational! Thank you for reminding me of one of my favorite books. I've handed 84 Charing Cross into more friends' hands. Tracking from one author to another? Dorothy Sayers to PD James to Nagoi Marsh to every other mystery I've ever read! Isn't it fun to track your reads! Thanks for stopping by Judith!